Laing Ecocirc E10-NSTN1W-19 3/4 Thrd Circ. Is the updated version of the Laing SM series Circ. Pump 115V (The E10 will fit into the system just as the SM-series pumps did). Plumbing requirements are the same. Check your old pump to specify if you are looking for 115 or 230 volts. (your old pump label will specify). Check your old pump to specify if you are looking for 115 or 230 volts and the 1'' or 3/4'' barb. (your old pump label will specify) The Ecocirc auto and vario were designed with the highly efficient electronically commutated permanent magnet motor (ECM technology). Our revolutionary pump is designed to consume 40% less energy. Added variable speed technology offers further power savings. The E10 pump is compact and lightweight, less than 5 lbs. It is whisper quiet and programmable designed with the latest EC technology. The flow rate dependent on the differential pressure control, adjusts the pump performance continuously and automatically to the requirements of the system. Get 98 watts of performance for only 65 watts of power. Domestic or international 50 or 60Hz same high flow. Lightweight, less than 5 lbs. Open Impeller - Resistant to Clogging. ¾ and 1 Barb Suction and Discharge. ¾ MPT Suction and Discharge. Maximum Working Pressure: 50 PSI. Viewed from the motor end. Electronically Commutated AC/DC/AC Spherical Motor. 115 Volt 62 Watts 60 Hz, 3100 RPM. 230 Volt 71 Watts 60 Hz, 3200 RPM. Our company name is Pool Spa Supplies, and our reputation is exemplary. We sure don't get to talk about pools and spas when we go home after work, as that could bore our loved ones. 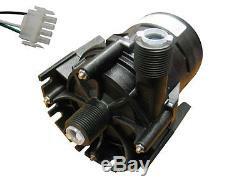 The item "Laing Circulation Pump, Marquis Spas, 909-NTW-18 3/4'' Threaded 115V 630-6330" is in sale since Friday, October 30, 2009. This item is in the category "Home & Garden\Yard, Garden & Outdoor Living\Pools & Spas\Other Pools & Spas". The seller is "poolspasuppliesonline" and is located in Houston, Texas.